Yes, this style is still in trend. Experient with the size and shape of the shoulder cut-out for unique styles. Easy-going, casual and trendy bralettes replace the typical heavy blouses. Corsetted blouse designs make their way into bridal fashion, with top designers like Manish Malhotra leading the way. Click here for more about the corset lehenga trend! A lot of latest runway designs at Lakme Fashion Week flaunted cape blouses. We also saw real brides wearing cape bloused lehengas and sarees! Long, flowy and transparent are big in Indian bridal fashion! 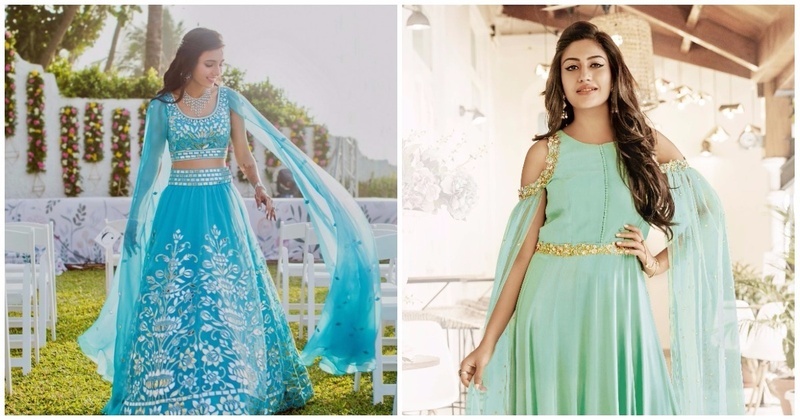 They do add some drama to your wedding lehenga. Fresh off the runway, designer Sailesh Singhania introduces a new trend - the cape saree. While the usual style of capes goes over the head and surrounds the body, his line flaunted ethnic sarees with bright, long capes billowing behind the wearer as she walked.